﻿ Pic Of The Day: Kavitha Drove Pink CAR! Pic Of The Day: Kavitha Drove Pink CAR! Ganesh Gupta who is the TRS Candidate for Nizamabad Urban Constituency filed his nomination Today. Nizamabad MP Kavitha stood as the centre of attraction during this nomination process. 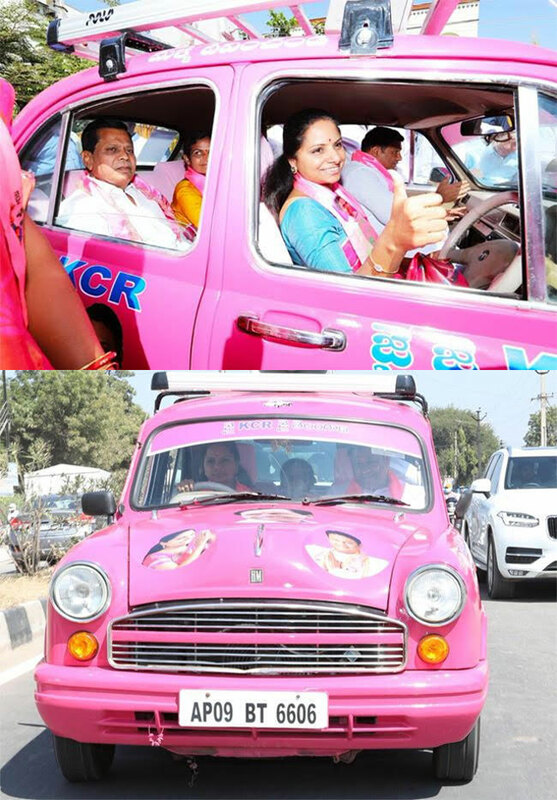 The Parliamentarian drove a pink coloured Ambassador car designed as the campaign vehicle of TRS from the residence of Ganesh Gupta to the corporation office. A Woman MP driving the campaign vehicle while going for the nomination of party member is one-of-its-kind incident. Later, Kavitha took part in the padayatra till Tahsildar Office along with TRS MLA Candidates, Workers and Supporters. Nizamabad Urban candidate Ganesh Gupta and Armoor candidate A Jeevan Reddy filed the nominations in the presence of Kavitha and Former Speaker Suresh Reddy. Pay Rs 3 Crore For Congress Ticket!